Devi Navaratri is starting from Saturday 5th October to Sunday 13th October. The Devi Navaratri celebrated on the first day of the bright fortnight of the lunar month of Ashwin (September And October). Devi Navaratri is a festival Goddess Durga Devi is worshiped in nine avatars. During these nine holy days, each day goddess Durga Maata is worshiped in different avatar. Devi Navaratri which occurs in Chaitra Masam is called as Vasant Navaratri. Devi Navaratri is also called as Sharad Navaratri. Sharad Navaratri is most important As it also called as Maha Navaratri. Navaratri is celebrated in different ways throughout India. 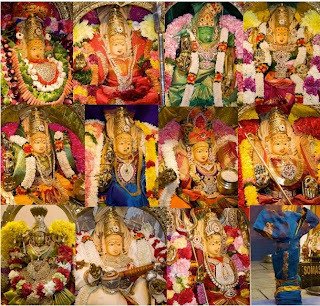 October 14 2013, 10th day of Navaratri : Aparajitha Puja or Shami Pooja or Vijayadasami or Dasara. The Other Navaratri Occurs in the Year are Chaitra Navaratri (March-April), This is also known as Vasant Navaratri or Ram Navaratri. Paush Navaratri (December–January), Magh Navaratri (January – February) and Ashad Navaratri (June – July). Magh Navaratri and Ashad Navaratri called as Gupt Navaratri Gayatri or Shakambhari Navaratri and is mainly observed in certain regions of North India. Devi Navaratri is big festival in India, during this days The goddess is dressed differently and perform Pooja. 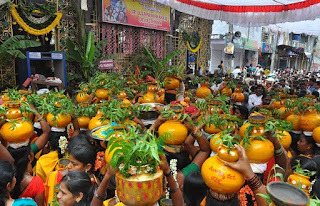 pouring Panchamrith (Ghee, Honey, Curd, Milk, and Ganga Jal or water) on the idol then decorating with flowers, vermilon (kumkum), turmeric, Sandal wood (Gandam). This nine days separated into three as first three days are celebrated for spiritual force called Durga as destroy all our impurities. then next three days are celebrated for spiritual wealth Lakshmi as she is the goddess of wealth. Last three days are celebrated for goddess of wisdom Saraswati.